Note: So, I had typed this out October 12th and realized, just now, that it didn’t get posted cue an eye roll. And I was debating whether to just wait until this next week to do so, but since it’s been 15 days (Ugh, 15 days!) since my last post, I just had to hit publish! Tell me this isn’t true. Now, I know there are exceptions to this and there are times, and things, that you cannot help but worry, however, stripped down to the bare minimum, is it not a waste of time? 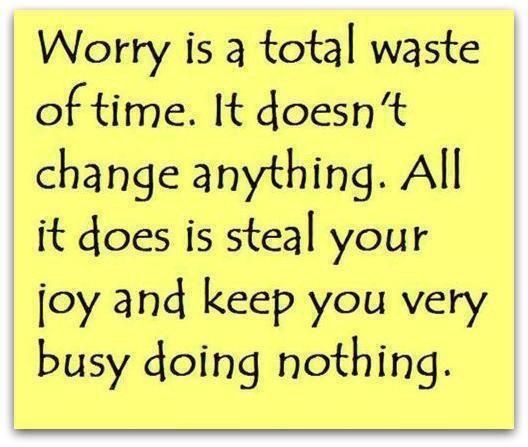 While worrying helps us by encouraging us to think through our decisions, actions, etc. one more time, all in all it does steal our joy and it does keep us busy doing nothing if we spend too much time on it. The sooner we accept that there are things we have no control over and recognize that we are giving away the power to control ourselves by allowing worry to stick around the sooner we can find joy.